Dieng, a plateau that lies in two areas : Banjarnegara and Wonosobo regency , Central Java. The name Dieng comes from two words in Ancient Sundanese language consisting of word 'Di' which means a place or mountain and ‘Hyang’ which means god, so Dieng can be interpreted as the mountains where the gods and goddesses reside. Dieng is famous for its natural beauty and cool atmosphere. There is also a tradition that is quite unique in the Dieng area, the tradition of cutting hair of dreadlock child. Dreads that exist in some native children of Dieng is hair that grows naturally and not artificially. There are dreads consisting only a few strands of hair curled behind covered by smooth ones, but some are really thick dreadlocks as if it had never been washed. It is said that dreads are a surrogate of local supernatural authorities. According to local belief, the hair can be cut only when there is demand from the children themselves. Cutting the dreads must also be through ceremony and ritual that has become a local tradition . Before the hair-cutting ceremony, there will be done first usually a prayer ritual in a sacred place like a Dwarawati temple, Arjuna temple complex, Sendang Maerokoco, Gatot Kaca temple, Lake Balai Kembang, Bima temple, Sikidang Crater , Pertapaan Mandalasari complex (Cave in Telaga Warna), as Kali Pepek and Dieng Cemetery. This is meant in hope that the hair-cutting ceremony will be running smoothly. While in the evening, the event will be followed by Jamasan Pusaka ceremony, a washing heirloom ceremony that will be taken by the dreadlocked kid in the carnival time later. On the next day there will be held a procession followed by the village elders, community leaders, traditional arts community groups and the local community to go to the hair cutting place. Usually the trip starts at house of culture leader elder and paused in Sendang Maerokoco or Sendang Sedayu to bathe dreadlocked child. After that the trip continues to the hair cutting place. Before the hair-cutting ceremony, normally there will be performed some traditional arts to entertain the public. After the performances over then the hair cutting ceremony will be held, which will be implemented by local community leaders, assisted by culture leader. The place chosen is usually in front of the Arjuna temple. 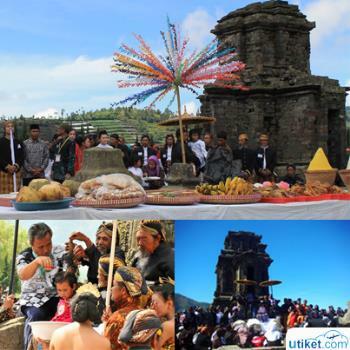 At the ceremony, there will be offerings offered in form of chicken head, tempeh gembus, Etawa goat, guinea pigs and some other crops harvested from Dieng plateau. The next event after cutting dreads is the submission of the objects that had previously been requested by the child whom the hair cut, the dreads will be washed away into Telaga Warna flowing into Serayu River and empties into the South Coast. It is a symbol of the return of plagues brought by the child to the gods. Local people believe that the tradition of cutting the dreads will make the child free from all kinds of diseases and bring prosperity. This tradition of cutting the dreads of Dieng community was already included in Dieng Culture Festival which is usually held in June each year. In addition to cutting dreads tradition, this event also features arts and cultural festivals and other typical products of Dieng exhibitions.